The concept of the exercise strategy employed in the use of the Stabilizer is based on gaining co-contraction of the transversus abdominis and the lumbar multifidus. The aim is to effect local spinal segmental support either by the action of these muscles in increasing tension in the thoracolumbar fascia and increasing the intra-abdominal pressure, or through their direct attachment to the lumbar vertebrae. The exercise is an isometric contraction elicited by drawing in the abdominal wall combined with contraction of the lumbar multifidus. Rehabilitation of motor control aspects of muscle function. The effectiveness is quantified objectively with the pressure gauge. *Stop focusing on the disc lesion. Right off the bat talk about the real problem that caused the disc problem, CHRONIC SPINAL INSTABILITY. *Annular fibers are some of the fastest to bind but take upwards of 500 days to fully heal. If the spine is left unstable after decompression binds the annular tear, the chances of healing are slim to none. Patients should start on the Stabilizer as soon as tolerable. *Patients must be made to understand that GAINING STABILITY AND STRENGTH IS THE REAL ANSWER. 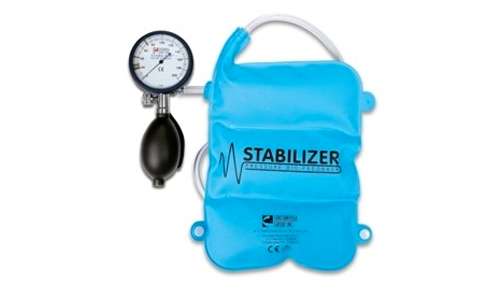 *Each patient should own a stabilizer of their own and it should be a part of the care package price.